If the current dance craze is anything to go by, we might soon be treated to a ‘Samantha’ dance. 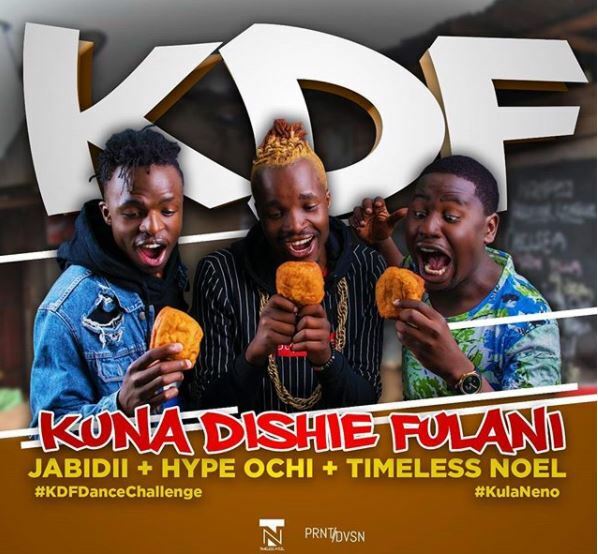 But my lame jokes aside…There is a new dance in town that has been inspired by everyone’s favorite breakfast delicacy; KDF. The big mandazis have become so popular that they have been honored in song and dance by none other than ‘Odi’ dance creators Timeless Noel, Hype Ochi, and Jabidii. According to the dancers, KDF stands for Kuna Dishie Fulani. Timeless Noel, Jabidii and Hype Ochi have used it to symbolize the need for God’s word as our daily bread. They have also spiced it up with a simple dance routine, calling it the ‘KDF Dance’. The video by BANTU FILMS has been directed by Kabi wa Jesus.